Tube ice is kind of regular hollow cylindrical transparent ice. Its external diameter can be divided into three specifications such as ø22、ø29、ø35mm, ranging from 25~50mm long. The inner hole diameter, typically ø 5~10mm long can be adjusted according to ice-making time. It has a good air permeability and long storage life. 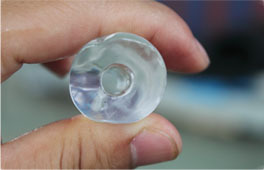 Tube ice is thick and transparent with long storage period. It isn't likely to melt in a short time. Tube ice is widely used in hotels, restaurants, bars, flight kitchens, catering, concrete cooling, chemical industry processing, food production processing, fishing industry and a variety of laboratory and medical applications. 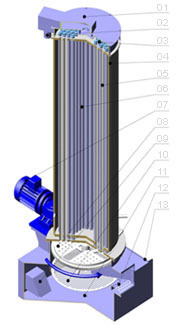 As shown, when the refrigeration system begins operating, the water in the tank below is transported from the water outlet into the water inlet of upper water tank by the water pump. After the water goes across the distributive pipe, it downward flows along the wall of the heat exchange tube. The water then begins a heat exchange with the refrigerant outside heat exchange pipe, which lowers the temperature. Some of the water is formed into tube ice, while the water which does not become ice returns to the low water tank. The water continues circulating so that the ice thickens, and the hole of tube ice also becomes smaller and smaller. 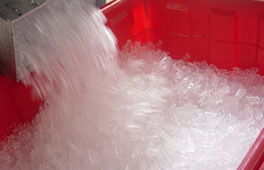 After a period of time, the water stops circulating and the refrigeration system changes into ice cutting mode. The ice cutting framework then begins to operate. The surface of the heat exchange pipe consists of refrigerant hot gas with high-pressure. The hot gas begins a heat exchange with the tube ice in the pipe wall. Hot gas makes contact between the tube ice and the wall of heat exchange, thawing the ice so that it loosens adhesive force. The ice then drops into an ice cutting framework because of gravitational force and finally is cut into many pieces of tube ice.